Yesterday I hurt my back power-walking my toddler around the zoo. He can sense when I'm already carrying an extra thirty pounds or so, and he knows I'll get so much stronger so much faster if he adds his thirty pound body into the mix. So, when not chasing / watching him closely, I was carrying him up and down the surprisingly hilly terrain. And it was at that point I felt my back do what it did when I was pregnant with Spencer. I think it's related to the excess weight gain on my fairly small frame, although there are times I think it may be sciatica. It's probably a combination. Luckily, it started much earlier with Spencer, so I've actually had quite a "easy" time with my back so far in this pregnancy. Unfortunately, I was walking oddly, in an attempt to favor the parts of my back that were killing me, and I managed to hurt the foot on the opposite side of my body from my back pain (the opposite side thing is why I think the foot injury is some sort of result of my back craziness). My back is only mildly hurting, my foot hurts really badly. My tummy still bugs me all the time, but it's not nearly as acute as it is in the beginning. It's more chronic, and it's very sensitive--I remember eating mainly turkey sandwiches the last few months with Spencer because everything else seemed to make me sick in some way. I think we're getting there. Factor in the reflux and heartburn (which I had with Spencer), and remember that I've yet to potty train my 2.5 year old, so there is still LOTS of bending over and squatting down, and you can see how gastrointestinal comfort of any kind does not seem to be in my near future. I consistently wake up with sneezing fits in the middle of the night, and I swear I never get past the first trimester fatigue. I hate wishing away my last few months with my baby boy, but often I think that the end of September can't get here fast enough. You're gonna miss these "pregnancy posts" aren't you? Probably about as much as I will miss being pregnant. 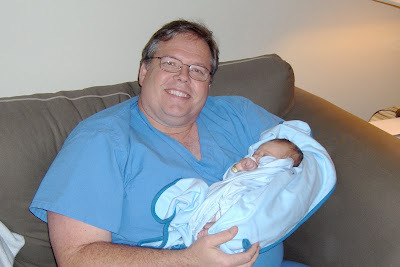 I've written no less than ten Father's Day blog posts in the last two years, in my head, while in the shower or while lying awake in the middle of the night. I've yet to post one. Shame! You know it's a terrible shame especially if you know my dad. He deserves everyone one of those "cognitive" blog posts and more--maybe even one spell-checked and with pictures! I've had writing one for this year on my calendar for a month now. And, especially in this instance, saying I've been too busy just sounds ridiculous. My dad is a busy man as well. And not just because he's a surgeon. You can be a "busy surgeon" and then justify whatever time you don't spend doing things with and for your family and other people. That's not the kind of busy surgeon that he is. Then, "What kind is he?" you ask. "Good question," I answer. My dad, when not busy with being a surgeon and all of the board memberships and extra meetings that come along with it is the sort of dad who took my sisters and me to the park when he had an evening off. He planned and squeezed in family excursions and trips whenever time and money allowed. He let us put thirty five barrettes in his hair while he sat and "relaxed" after work. And then he let us take pictures. (Sorry I don't have one to post today!) He told us we were smart, talented, and beautiful. And he communicated that he believed those things by how he treated us, spoke to us, and bragged on us to whoever he could get to listen. I know I'd be embarrassed to know how many nurses and doctors have had to hear about my honor roll achievements throughout the years. My childhood was far from perfect, and my dad has probably "grown up" as much as I have in these past (almost) twenty-nine years. And while that does mean that there are things we all wish could have been different, it also means that I had a front row seat to see God. "What in the world does that mean?" you ask. "Good questions this morning!" I answer. You see, I've often wondered about God. What's His deal? What's He like? Does He even exist? Whose version of Him could possibly be accurate if He does exist? Would He even want His name and every pronoun referring to it capitalized? You get the idea. I wondered these things at age two, and I wondered them at age twelve. I continued to wonder them while everyone else wondered what I was going to major in. So, I attempted to answer both parties; I declared a major in Biblical Studies with an emphasis in Theology ("the study of God," to those of you falling asleep as you read that word. And, no judgement from me, I never had trouble falling asleep in college. I could always find a textbook to aid in that endeavor). I loved my classes (graciously paid for by my dad, by the way--never in a "you're costing me tons of money, kid!" sort of way); and I learned a lot. It was the most fun I've ever had school-wise. And yes, I'm one of those who has fun "school-wise." However, when it comes down to it, when life seems inexplicable, when I think about what I'm going to teach my kids about God, life, etc., when I think about what I really know to be true and why, I don't think about Fretheim's "The Suffering of God," or Ladd's "New Testament Theology." I think about my dad--what his life has displayed is the greatest "theology" lesson I've ever been taught. I've seen real-life redemption, true repentance, transformation and renewal, forgiveness that seems impossible, a love for justice that's unmatched, joyful and selfless giving, humility not-often-seen in "busy surgeons," and unconditional love. His life exemplifies these things because of his relationship with Jesus Christ. And while I could spend years writing an entire blog with daily entries detailing all the ways in which my dad's life has taught me those things, you'll just have to take my word for it today--and at least for the next five years or so. Maybe I could pull a little something together after that. Happy Father's Day, Dad. Thank you for everything I've talked about above and all the other things I've had to omit. I love you so much, and I'm so thankful you're my dad. Jonathan, Spencer, and I are pretty thankful that you're Spencer's Papa too. Tell your patients to stay well so we can see you tonight. Edited to show Evelyn, only one week old, already thankful to have such a special Papa. You seem to love you cloth diapers, which, honestly, to me seem like they'd be hotter/bulkier/less comfy in the summer. But we got them back out when I felt like I could stomach it, and it's going really well. You love to make a doggie cage out of the laundry basket--you are the doggie. You get under it (while it's turned upside down), then you call me into the room so you can tell me you're a doggie. You love the hose, but only when we chase you around the backyard with it. You love a reason to run. You still love to sleep with your paci. We've had a couple of incidents that have made me pretty sure you're ready to potty train. I was hoping we'd find a camp for that. You did NOT scream when I left you in the church nursery Sunday. First time ever. I stayed at least 15 minutes and played first, which I never do. I'm not sure if this is what helped or it if just all happened on the same day. You love to go for rides in the car. You'll just ask to go get in the car. When we pull back onto our street, you often whine / fuss / scream depending on your mood and how tired you are. You're usually disappointed to come back home (it's not like we don't take you places all the time!). You've needed us to reinforce lots of boundaries lately. Often and continuously. You do not care to speak of the baby in mommy's tummy; but you're infatuated with how my belly button looks and constantly compare it to your own. If it's possible, you get cuter every single day. You grew two inches in about 3.5 months. I'm not an expert, but that was surprising to me since you're two and not 4 months. All the sudden everyone was asking us if you were taller--and you were! About a month ago, you were 30 lbs. and 36". You LOVE "Go, Diego, Go," and all animals, and the sounds they make, etc. More and more you enjoy having friends over or going to friends' houses. You still don't play "with" them, usually; but I think it's more of a function of your personality than your social development. You're pretty cuddly, much more so than when you were a "baby." We love it. You don't love the pool. I do. It's a bummer. You LOVE music. You enjoy "conducting" us more than you enjoy creating it yourself, and if someone sings you a song, he or she needs to be prepared to sing it a thousand times. If it's a song that pleases you, you don't think it ever gets old. You're such a precious little boy. I think your Daddy and I enjoy you more every day (not that you don't have your moments....that turn into hours. But we try to remember you're 2.5). My mom warned me that I'd mourn the "loss" of Spencer as my baby as I got ready to welcome the next one. And, as is usually the case, she was right. And, we all mourn in different ways, right? I apparently, decide to dress him in ways I didn't even love when he was a baby. I'm sorta cracking myself up. I was picking out fabrics for baby girl's room, and instead of getting anything for her, I came home with madras plaid yardage. I asked my mom to sew a romper for Spencer "for the beach," and "the 4th of July," and "for church when it's so hot." I finally put on my maternity shorts from the summer I was pregnant with Spencer. They are supposed to look nicer than gym shorts which are the only shorts I'd been wearing up until now. Loose, maternity capris have worked well so far for comfort and my regrettable lack of desire when it comes to shaving my legs. But, this weekend was going to be hot, and we were going to the park, and I told myself it was time to actually participate as Spencer's mother. "So put shorts on and plan on standing up on the playground for a long time, sweating." I put sunscreen on too, so as to have no excuse to go sit in the shade. Now, I may have mentioned previously that I gain a lot of weight when I'm pregnant. I have said that to many-a-woman who has answered me back, "Oh, me too! I gained fifty pounds with so-and-so." And to that I laugh and think, try adding another "healthy" pregnancy on top of that fifty." I gained over seventy pounds with Spencer. I quit weighing myself after that, and he came at least a few weeks later, maybe a month. I think I forgot the exact details for my own mental and emotional protection. To be fair, I was not overweight when I got pregnant (either time), so I know that I needed to gain weight. I was happy to gain weight. I'm ALL ABOUT giving the baby what it needs. I'm just not all about growing out of every article of clothing that can be purchased in the greater Little Rock area. And that's how seventy plus pounds starts to feel on a 5' 5.75" woman. And, to be even more fair, I was not underweight when I got pregnant either time either. I was like Baby Bear on Goldilocks. I was just right. There have been times in my life when I was not "just right," and to be honest, I like being "just right." And this excessive weight-gain thing has bothered me more this time around. I honestly think it's because I've felt a little better this time and I have more energy and where-withal to think about it. Anyway, back to the shorts. I forced myself to put on the shorts, which is a bigger deal if you gain weight more in your lower half, and I, of course, do. So, I put them on thinking, "You know what? This is NOT a big deal. You have been doing better this pregnancy. These are going to fit fine. You are nowhere near 200 lbs. You need to relax. Wouldn't you rather be cool than keep from wearing shorts? No one cares but you. Everyone knows you, and everyone knows you're pregnant...." I think mental health professionals call this "self-talk." I call it my life. So, I think, "Well, I have three pairs of shorts, and if I remember correctly, I got a couple in one size and then one pair in the next size up, right? I think that's what I did." So, I check the other two shorts' tags. They are the same size. I take off my shorts and check the tag, same size. Hmmm. Nice. I put the shorts back on and think, "I'm definitely not interested in knowing what I weigh now! That's such a bummer. I guess I'll blame it on the sinus infection and all the continuous-calorie-drip days that ensued as a way to keep from throwing them up. I had to take those antibiotics. I had to keep them down. That TRULY was for the baby. Just keep telling your self that...."
We finally get in the car to go to the park. Jonathan, Spencer, and me--to enjoy a fun family day. And I keep thinking about it. I'm just really confused. I mean, there's a two month difference too! Shouldn't that help this too-small-already thing even a little bit? And then, I did it. I told Jonathan. And in about one-quarter of a second he looked at me and said, "You're two months ahead this time." And that, ladies and gentlemen, is what it's like to be me. pregnant.